Whatsapp founder Jan Koum auctions about 10 amazing Porsches. In chis childhood Jan Koum, founder of Whatsapp dreamt of owning a Porsche. The least you can say is that he fulfilled his dreams. And that’s an understatement. Gooding&Co is auctioning off about 10 amazing Porsches of the Jan Koum Collection at Amelia Island. An absolute dream for Porsche fans may come true. However, seen the rarity of some of the cars combined with the low mileage on the counter of the cars, will probably make the prices rise. Add some cars of the legendary Dobbs Motorsports collection to the auction, and you get the importance. In 1979 Porsche only delivered 7 Porsche 935’s. These cars are the ultimate development of the Porsche 935 customer program. Even though they look similar to the Porsche 935/78, the 1979 Porsche 935 models were equipped with some special features like an inverted gearbox and larger brakes. One of these 7 cars comes up for auction at the Gooding & Co auction at Amelia Island. Chassis 930 990 0027 was ordered new by Otis Chandler, a devoted Porsche enthusiast and member of the PCA. It was remarkable that Otis Chandler wanted his new Porsche 935 delivered in the same Sunoco livery as his Porsche 917/30 Can-Am Spyder. Otis Chandler entered the car at the 1979 6 hours of Riverside (DNF). That was the only outing in a race of the Porsche 935, when you do not take HSR vintage races into account. Aircooled Porsche 911 RS’s have been high in demand among collectors the last few years. At Amelia Island, Gooding & Co is auctioning some of them. Next to the 1973 Porsche 911 Carrera RS Lightweight and a 1973 Porsche 911 Carrera RS Touring, 3 more of them come up for auction. And those 3 deserve special mentioning. The 1992 Porsche 964 Carrera RS is a 3 owner car with just 25,000 km on the counter. The original Italian owner custom-ordered the car in the ultra-rare paint-to-sample Blossom Yellow. The 1993 Porsche 964 Carrera RS 3.8 is a rare bird and is considered the ultimate normally aspirated Porsche 964. Only 55 Porsche 964 Carrera RS 3.8 left the factory. The complete history of this particular car is mentioned in the book “Porsche 964 Carrera RS 3.8” , by Jürgen Barth, Norbert Franz, and Robert Weber. This car originally spent its life in a Japanese collection. Renowned Porsche enthusiast Prescot Kelly discovered it in Japan and brokered the sale to Jan Koum in 2017. The odometer displays just over 15,420 km. 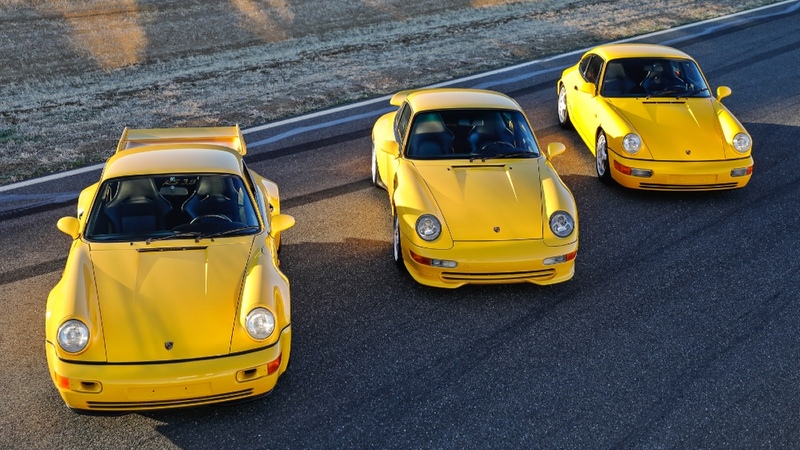 The original owner of the 1995 Porsche 993 Carrera RS, bought the car at Porsche Zentrum Nürnberg, with several rare Exclusive Department features. Included among the option list were stainless steel oval tailpipes, RS-logo door-entry guards, aluminum-look shift knob, and instrument dials with chromed bezels. Just three examples of the 993 RS were so equipped, and this car carried an original purchase price of DM 161,400. The car resided in Germany until Jan Koum added it to his personal collection in 2017. The car is in excellent original and unmodified condition with just under 55,000 km on the odometer. Only 918 Porsche 918 Spyders were built. Just 294 of these Porsche supercars were shipped to the USA. Jan Koum ordered the car with the Weissach package. After delivery of the car, only 40 miles have been put on the counter. That means this may be the lowest mileage Porsche 918 Spyder you could ever lay your hand on. Needles to say the car is in a pristine showroom condition. For 1984, Porsche built 20 examples of the 911 SC/RS to satisfy FIA Group C homologation requirements. Expert Jürgen Barth states 5 of them were assigned to David Richards Autosports (DRA) for conversion to rally specification and to be used as Rothmans team cars. After its rally career the car moved to a Japanese collection. This powerful Porsche 911 SC/RS is a rare and important piece of Porsche motor sports and will probably end-up in a top Porsche collection. A final advice for all our readers : never buy a car without a proper inspection. And for high-end cars, we do advice a thorough ppi by a specialist.